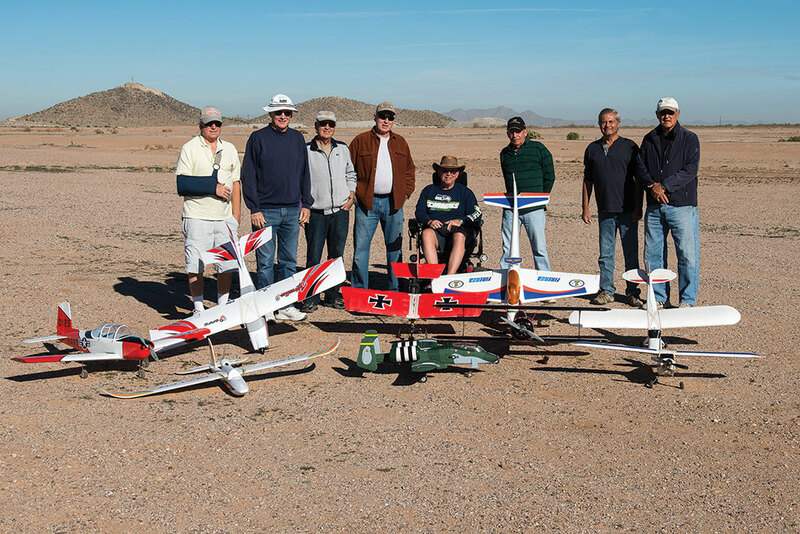 The motley crew showing off the club’s fleet. Calling all RC Flyers and wannabe flyers; join us in the hobby of flying radio controlled model airplanes. Flying can be casual, relaxing or as exciting as you can stand depending on the type of aircraft you choose. Got questions? Contact us for guidance and/or information on how to get started in the hobby. Fall has arrived, and our setup tables have been moved to our new flying site. With the cooler temperatures and later sunrise, there will be more flyers enjoying the new flying field. The Robson RC Flyers have moved to a new location at what used to be the end of Harris Hawk. Easily accessible with a car, truck or golf cart, there is a lot more air in which to fly and no fences, trees or cacti to greet us on landings. Our flying hours are after 8:00 a.m. Tuesday, Thursday and Saturday or when the wind gods suggest otherwise. As the days get started later and temperatures cooler, we will adjust accordingly. Flying is available to all residents of Robson Ranch with an AMA license. All planes are electric powered. No gas planes permitted. Interested in the hobby or need a new hobby? It’s a great way to get out of the house and enjoy the camaraderie and information sharing that the club enjoys. Flight training and plenty of advice is available from our members. Bring a chair (no benches) and come join the fun. Club meetings are the third Tuesday of each month in the Toltec Room at 10:30 a.m. Grab a cup of coffee and join us. The more the merrier! For additional information contact the club president, Eddie Peril, at 520-374-2599 or Paul Downey at 520-876-9507.